Let this beautiful bouquet dress up holiday décor and days will definitely be merry and bright! 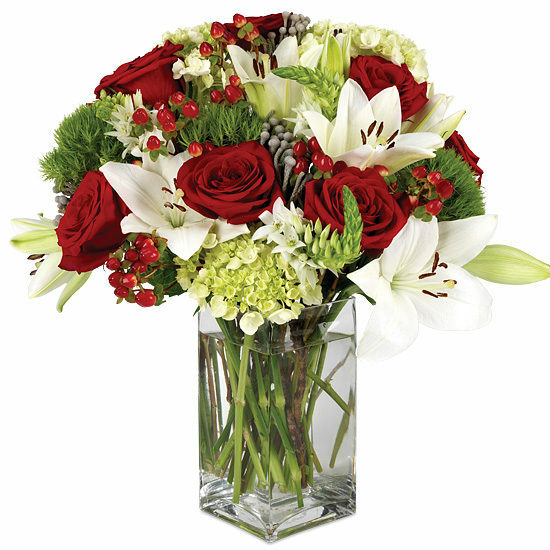 Pristine red Freedom roses, Green Trick carnations, and white Asiatic lilies mixed with silver brunia, Stars of Bethlehem, red hypericum berries, and mini green hydrangea is indeed a joyful sight full of texture, color, and variety. 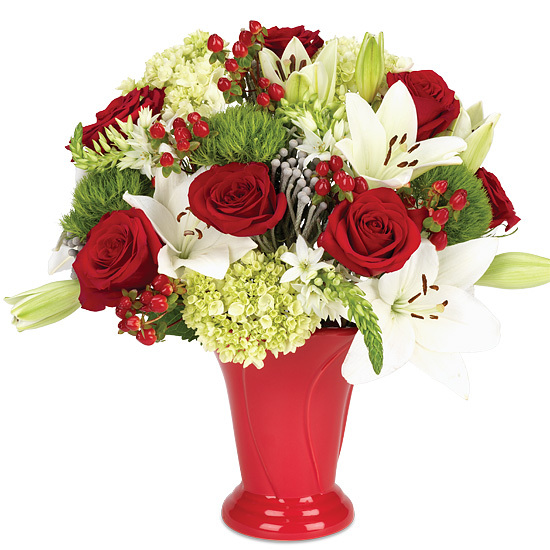 The generous bouquet is a vision of Christmastime in our ceramic vase with wide sweeping ridges, a cheerful red vessel by Haeger. Please note: as shown vase will arrive in separate shipment. Some varieties of flowers like hydrangea may look a bit tired upon arrival. Don’t despair! They’re healthy – just thirsty… submerge the blooms completely in cool water for approximately an hour, they will rehydrate and perk up within 24 hours. Hydrangeas may look a bit tired upon arrival. Remove all foliage that will fall below the water line. Cut stems underwater to the appropriate length of your container or vase. Do not be afraid to cut! As the lilies open, you may gently pull off the pollen anthers to avoid pollen dust. Be careful not to get lily pollen on your clothing or linens. You may wish to place a protective mat under your bouquet to prevent pollen from falling on your furniture or carpet if you do not remove the anthers. Always add fresh water daily. Change water and re-cut stems every other day.